I have no words for this. I haven't read this in quite a while and yet it still stings. I am angry and astounded and confused. I don't think I can ever forgive my mother for this. "Surviving childhood should not depend on luck." "There's always someone, haunting someone, haunting someone. and then the memory of the dream." In my mother’s own words and pictures I was merely an object of clinical observation, as were her “weak, worthless” patients. 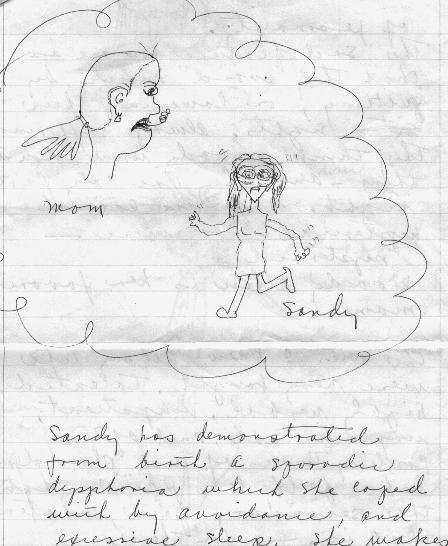 Sandy has demonstrated from birth a sporadic dysphoria which she coped with by avoidance and excessive sleep. She wakes unrefreshed. It is somewhat periodic, worse in the morning, and lifts by evening. I'm reading more about M.A.O.I.s for this. Both families have a sprinkling of this type of personality. The sad feature for me is that they "avoid" anxiety by quitting or lowering their sights (sic). Always suffering. They think nobody understands them -- and they are only partly right. They are called hysterical -- or were ...... hysteroid? Woody Allen is her favorite man. My mother mentally and verbally abused everyone around her. And, of all the people back in the early 1960s -- my own mother, a medical doctor, and a psychiatrist, she was the only person who obviously knew I had chronic depression and anxiety yet purposely withheld compassion, treatment options, and essentially destroyed my ability to cope with my disability. She also knew I was experiencing episodes of depersonalization that grew increasingly worse over time. Though my mother never struck me or abused me physically (though we did have ludicrous fights that involved slapping, screaming, hair-pulling, tossing of small objects at each other, and slamming of doors), her misuse of her medical and psychoanalytic knowledge was abuse in and of itself -- or more specifically, neglect. Imagine I had been the daughter of an ophthalmologist and had been born blind. Picture said parent telling me I was "defective" and "useless" because of this and giving me no assistance such as sending me to a special school for the blind, teaching me braille, purchasing me a cane or a seeing eye dog. On top of this, imagine said parent purposely tripped me or placed obstacles in my path causing me to fall down and then laughed or criticized me for my "clumsiness." And imagine said parent, an eye-doctor, kept my blindness a secret as it would be shameful for an ophthalmologist to have a blind child as it would "ruin his or her reputation." There is some indication my mother may have had Borderline Personality Disorder or Paranoid Personality Disorder. I have discussed this over the years with my therapists and have recently read a number of articles and books on the subject of BPD. But of course this is only diagnosis in hindsight and it will be impossible to ever understand what caused my mother's rage and destructive relationships with others. As noted in another section on this site, I found out (through a bizarre series of events) that my mother's first husband paid for her psychiatric treatment for a "rage problem" in the late 1940s and the early 1950s. I have always felt she switched from internal medicine to psychiatry to understand herself. She kept this a secret from everyone save her first husband. I myself have some Borderline qualities and have received help for this with medication (Lamictal - a mood stabilizer) and DBT (Dialectical Behavioral Therapy). Borderline Personality Disorder may be renamed "Mood Dysregulation Disorder" in the near future. Individuals with BPD can have serious episodes of depersonalization. There is always the question, "Was my mother abused and neglected herself?" I will never know. There is some indication (I’ve gleaned from discussions with two cousins) that she and her sister were treated harshly by both parents and they may have been subjected to emotional abuse at minimum. I cannot say with absolute certainty that my depersonalization is the direct result of crazy making or neglect or mental abuse, even though DP can indeed be interpreted as a coping mechanism in healthy individuals, and there is some indication that many not all with chronic DP do have abusive childhoods. Yet, there are many children who have suffered far more serious abuse or trauma and have not become depersonalized. My depersonalization, depression and anxiety are the result of a combination of factors yet to be properly identified. The connection may be that those of us with mental illness who have been abused, were abused by parents who themselves were mentally ill. We simply inherited their genetic legacy. This is however no excuse for mistreating a child. Every child on earth deserves unconditional love and support. Currently, in my case, I subscribe to the Diathesis-Stress Model which describes the complex interaction of Nature and Nurture which could help explain the evolution of my mental illness. My mother's crazy making resulted in many problems I have simply interacting with other people and having a sense of self-confidence and self-worth. I have a weak sense of "Self" in layman's terms. I have finally begun to uncover what I believe to be my "true identity." Yet I am still concerned about alienating people with my own opinions. I have difficulty with personal relationships -- feeling relaxed in the company of others without needing to please or "entertain" them. I have trouble seeing the "middle ground" or "grey" areas when evaluating situations and other people; I see only "black" -- complete negativity/imperfection or "white" -- complete "perfection." I frequently catastrophize or am overly optimistic. These are the psychological issues I deal with daily, not the perceptual distortions and physical symptoms. This is where Cognitive Behavioral Therapy and Dialectical Behavioral Therapy come into play, not as a cure for my DP, but for the other issues in my life that are the result of psychological abuse and neglect. Unfortunately my work in therapy has been "contaminated" by the fact that my mother was a psychiatrist. The power she had over me, both as my mother and as a professional (who espoused multiple theories of mental disorders), was overwhelming. I refused to have any female therapist for years for this reason, and currently see a male therapist. I still become preoccupied with the opposing theories of psychoanalysis and neurological models of mental illness, and the Nature/Nurture question still haunts me. But I now have greater faith in a medical model of my illness with further understanding of the complex interaction of biology and psychology in the formation of an individual. These two factors are inseparable. 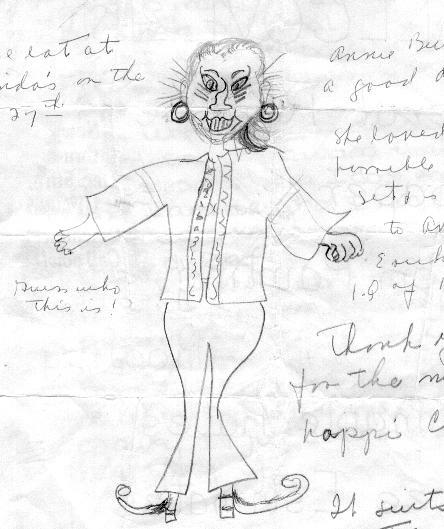 The "doodles" above and below are only two samples of my mother's artistic handiwork and odd style of letter or journal writing. She saved these things for me to find -- carefully sorted in a dresser drawer in her bedroom; I discovered them with similar works while cleaning out her house after she moved to her nursing home. The pain and horror they caused me stays with me to this day, and I am still confused as to how to react to them. I still have a tremendous degree of denial that she could be this way. This is in a sense more crazy making and emotional abuse. These writings and drawings speak for themselves. This is how she saw me. I assume this is how she saw herself, which is even more mysterious. These are her own thoughts about me and her relationship with me. What is particularly telling in terms of parental neglect is her noting (without emotion) that she was very aware of my emotional problems "since birth" and mentions "reading more about MAOIs" (anti-depressants) as a result; but she never took any action to get me help until I begged for it at the age of 15. This is a self-portrait drawn by my mother, similar to the drawing of herself as a demon-like presence at the top of this page. My mother drew this herself and mailed it to me. This is a typical version of her letters to me -- chicken scratch on scraps of paper. I received this in college around 1980. I had purchased an unusual jacket for her as a Christmas present. She drew herself, as a demon, wearing the jacket I had sent her. Again, oddly enough at the time, I didn't think twice about the message she may have been sending to me. Only now do I see some acknowledgment (on her part) of her terrorizing me. I am still not clear why she depicted herself in this manner. I would say these communications speak for themselves, yet I don't think I will ever understand my mother's motives, or how she truly envisioned herself. Was this some indirect apology, or was this more crazy making? And why did she carefully preserve many such writings and drawings for me to purposely discover after her death?